Penn Systems Group offers a service bureau, staffed with full time professionally trained employees, to fulfill all of your optical disk or CD-ROM conversion needs. We pride ourselves in quality work and reasonable turn-around. C&A ImageChex Express Advanced is a comprehensive check processing software package designed to work with Canon's CR-Series Check Transport Devices. As a complete transaction-balancing solution for central sites or branch locations, the ImageChex Express Advanced and CR-Series combination represent an affordable option for high speed check imaging and processing to meet a variety of business needs. ImageChex Express Advanced offers full capabilities to capture, proof, store and retrieve check images and MICR data through a simple, intuitive Windows® interface. Advanced features are available for users to generate electronic and physical cash letter, online balance and adjustment, and customizable reporting. ImageChex Express Advanced also features built-in recovery and verification tools to help ensure uninterrupted business operations. Designed for easy installation and operation, ImageChex Express Advanced and CR-Series solutions can be deployed virtually anywhere checks are received and processed, including banks, utility companies, doctor's offices, insurance agencies, and retail stores. This winning combination provides a cost effective solution for organizations looking to boost customer service and profitability. 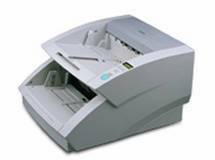 Whether deployed at the teller line in bank branches or commercial/retail locations, the CR-55 scanner meets the requirements for distributed check capture and remote deposit, offering Canon hallmarks of affordability, high performance, and ultra-reliable design. For unmatched image reproduction, the user-friendly CR-55 offers a choice of high quality scanning in black and white, grayscale, or 24-bit color and resolutions up to 300 dpi. The CR-55 scanner can feed batches of up to 50 items at a time, and capture MICR data along with images of both sides of checks at a fast 55 checks per minute or 110 images per minute (U.S. checks, 200 dpi, B&W or Grayscale). Featuring a sophisticated Canon patented magnetic head, the CR-55 supports E13B and CMC7 MICR fonts. A built-in, pre-scan imprinter comes standard for printing and capturing important endorsement information. 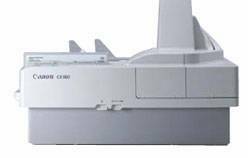 The CR-55 device also features Infrared Double Feed Detection and Paper Thickness Adjustment capabilities for dependable paper feeding and image capture. Designed for a wide range of check processing environments, the CR-55 requires minimal training and effortless operation. The CR-55 comes bundled with Silver Bullet Ranger™ driver and IQA Module, in addition to Canon's Scanning Utility Software. For plug-and-play connectivity, the CR-55 is equipped with a Hi-Speed USB 2.0 interface. Best of all, the CR-55 device offers streamlined deployment and an economical solution for distributed check capture. The CR-55 has been tested for compatibility with many of the financial industry's leading check and remittance processing solution providers. Please click here for a comprehensive compatibility listing. 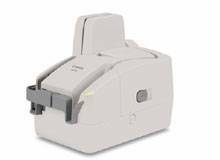 The CR-180 is a compact Check Transport device that scans both sides of 180 checks per minute, and has ability to read the MICR (Magnetic Ink Character Recognition) characters on checks using its built-in magnetic head. Along with Canon's industry-wide reputation in document feeding performance and image quality, the CR-180 is one of the fastest devices in its class. The CR-180 has been tested for compatibility with many of the financial industry's leading check and remittance processing solution providers. Please click here for a comprehensive compatibility listing. Accommodating scanned documents up to 4.6 inches (118mm) wide by 9.1 inches (230mm) long, the CR-180 delivers outstanding performance and functionality to financial institutions, check processing centers, and retail outlets. Translating innovations into solutions has made Canon a leader in imaging equipment and information systems for more than 40 years. By extending the boundaries of image capture, Canon Digital Document Recorders can be deployed virtually anywhere. Combining advanced capture, archiving, and networking in an economical, all-in-one desktop system, they offer many of the capabilities of complex systems, with Canon's trademark plug-and-play ease. All operations are performed on a large 8.4", high-resolution, LCD color touch-screen panel. Fast, reliable, and user-friendly, this all-in-one, compact desktop system allows users to scan document images, then store and share them directly over networks or onto CD-Recordable discs, a standard, low-cost, reliable archiving medium. By way of a familiar file folder structure based on Windows(r) explorer, CD images are easily retrieved and viewed on virtually any PC by anyone with access, all without special software. Documents scanned by the CD-4070NW are automatically saved on the internal hard disk as backup data, prior to being written to a recordable CD. As long as the data is retained on the device, it is available to create multiple copies of the same disc for distribution, or to search for documents through Web browsers from remote PCs over networks. The CD-4070NW offers workgroups convenience and versatility by allowing easy access through a standard Web browser. Through 100Base-T networks, you can have accessibility from any network PC using standard Windows software. It allows network users to search, view, and download documents archived on the CD-4070NW device's hard drive by using either a key word, file name, file type, date, or directory reference. Additional network scanning capabilities include features such as scan-to-file and scan-to-e-mail. Now 24-bit color-enabled, the CD-4070NW converts documents into multipage TIFF, JPEG, or PDF image files. The perfect productivity boost for small offices and workgroups, the Canon DR-1210C scanner quickly and reliably accommodates stacks of forms, invoices, or contracts with the 35-sheet ADF at rapid speeds of up to 12 ppm* in black and white, grayscale, or color. 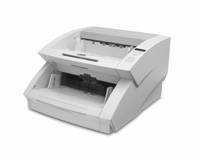 This model also offers the versatility to scan books, magazines, or business cards using the flatbed capability. High-quality image reproduction starts with Canon's advanced 3-Line CCD sensor technology and 600-dpi optical resolution. Automatic image processing features, such as Auto Page Size Detection, Text Orientation Recognition, and Deskew, ensure efficient, effortless document capture. Incorporating 3-Dimensional Color Correction technology, the DR-1210C scanner delivers vivid color images that are true to the original document. Even handwriting, fine lines, and low-contrast image details are captured with clarity and precision. Enjoy one-touch operation with three built-in Scan-To-Job buttons for Copy, File, and E-mail functions. Additionally, up to 50 different functions can be assigned to five customizable buttons for operation by multiple users or common tasks. For convenient walk-up scanning, images can automatically be routed via e-mail or to a network file folder directly from the user-friendly control panel. Canon understands that ease-of-use and maximum flexibility mean limitless productivity. For added value, the DR-1210C comes bundled with a wide array of software applications, including CapturePerfect 3.0, Adobe® Acrobat® 7.0 Standard, OmniPage SE 4, and Presto! BizCard Reader 5 SE, in addition to a full-featured ISIS®/TWAIN driver. The DR-1210C has been tested for compatibility with many of the industry's leading electronic document management solution providers. Please click here for a comprehensive compatibility listing. When it comes to cost-effective, reliable document scanning, look no further than the DR-2050C. Weighing in at only 5 lb., this scanner is ultra compact and adds immediate style, not clutter, to your desktop with its sleek, streamlined body design. 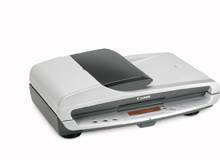 In keeping with Canon's tradition of industry leading price-performance, the DR-2050C document scanner fits in tight budgets and tight spaces. The DR-2050C incorporates Canon's renowned, high-precision roller system that delivers smooth, jam-free feeding. Whether scanning single sheet documents or multiple sheets of mixed document sizes and weight, the DR-2050C offers uninterrupted performance with one of the most reliable feeding systems in its category. Productivity enhancement features truly set the DR-2050C apart from other workgroup scanners. Up to 100 user-preference profiles can be programmed and stored for fast, easy access to frequently used settings. The DR-2050C offers automatic image cleanup capabilities for removing blank pages and borders, document skew correction, and edge enhancement. And, it's uniquely equipped with a Folio function for scanning 11" x 17" paper sizes. Bundled with CapturePerfect 3.0, Adobe Acrobat 7.0 and OmniPage SE, you get more than a scanner when you purchase the DR-2050C. Canon's CapturePerfect application is loaded with unique, easy-to-use features, making image capture a more user-friendly experience. Offering a number of convenient scanning options, you can save, print or email scanned images with one-click simplicity. Compact, powerful, and fast. 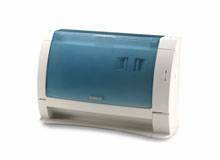 The DR-2580C is a versatile scanner designed to meet the diverse imaging needs of your busy office. It accommodates a wide range of source materials, including plastic ID or insurance cards. 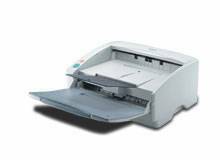 And paired with the optional, user installable Flatbed Unit, the DR-2580C is capable of scanning books or fragile documents. Large documents up to 11" x 17" in size can easily be scanned with unique Folio mode function. At a mere 4.2 lbs, this powerful scanner is both compact and portable, so you can put it on your desktop, or take it on the road. The DR-2580C is not only one of the smallest, but also one of the most easy-to-use scanners in its class. You can enjoy one-touch scanning by simply assigning your most common functions to its customizable Scan-To Job buttons. Despite its small package, the DR-2580C is big on performance. This innovative machine offers you the most advanced features in document scanning. Enhance black-and-white scans with the Contrast Adjustment feature that sharpens images and makes text more distinctive on low-contrast documents. The Punch Hole Removal function removes the black dots that appear when you scan pages from booklets or binders. And the new Rapid Recovery System, which only sends completed image data to your application software, offers seamless scanning operation should a feeding error occur. Built to boost productivity, the DR-2580C scans at a rapid rate of 25 pages or 50 images per minute (letter/200 dpi/portrait). The DR-2580C comes bundled with Canon's CapturePerfect and Adobe® Acrobat® software, in addition to a full-featured ISIS®/TWAIN driver. The DR-2580C has been tested for compatibility with many of the industry's leading electronic document management solution providers. Please click here for a comprehensive compatibility listing. Canon, a leading imaging systems solution provider, now brings a new standard of price/performance to the departmental level with the Canon DR-3080CII - a high-speed, high-performance, color desktop Duplex Scanner. Never before have so much advanced functionality, enhanced productivity, and superior reliability been offered in such a compact package. With workloads expanding and turnaround times shrinking, no wonder your need for improved productivity is greater than ever before. 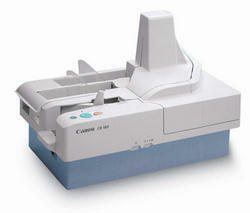 The Canon DR-3080CII high speed Duplex Scanner performs much like those used in production environments. All of which adds up to production-level performance at a departmental-level price. The DR-3080CII scans at speeds up to 86 images per minute. It offers a wide choice of scanning modes-24-bit color, 256 levels of grayscale and black and white modes, even advanced text enhancement for the documents with text on a dark background. 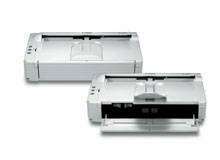 Equipped with dual sensors, the DR-3080CII provides fast efficient one-pass, two-sided scanning, for robust document management and flexible paper handling. Connectivity is easy, too. And with only minimal training, virtually anyone can learn to operate the scanner efficiently in a short amount of time. Canon's DR-3080CII simplifies essentially every aspect of the image capture process, ensuring as much hands-off control as possible. The DR-3080CII has been tested for compatibility with many of the industry's leading electronic document management solution providers. Please click here for a comprehensive compatibility listing. Productivity comes standard with the DR-5010C. This compact scanner is packed with power, yet built for effortless scanning of paper sizes up to 11" x 17". In addition to offering high-quality, production-level scanning at 50 ppm in color and black and white, the DR-5010C is versatile enough to meet a wide range of business needs. Whether scanning thick documents or plastic ID cards, the DR-5010C ensures smooth feeding with its innovative Straight Path design. Diverse automatic and customizable functions allow you to scan documents faster and more efficiently than ever before. 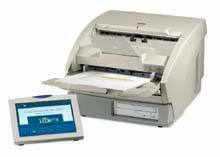 The DR-5010C can reliably handle batches of mixed document types with the ability to automatically straighten skewed documents and rotate upside down images. In the event of a misfeed, the Rapid Recovery System allows you to seamlessly continue scanning right where you left off and only sends completed image data to your PC. Because speed alone isn't enough to satisfy the demands of paper-intensive business environments, the DR-5010C was designed to be as accurate as it is fast. For improved OCR results, a Custom Color Dropout feature allows you to remove color elements such as lines or shaded boxes. Automatically optimize readability of documents containing hard-to-scan elements such as faint text or pencil writing with two Text Enhancement modes. The DR-5010C comes bundled with Canon's CapturePerfect and Adobe® Acrobat® software, in addition to a full-featured ISIS®/TWAIN driver. The DR-5010C has been tested for compatibility with many of the industry's leading electronic document management solution providers. Please click here for a comprehensive compatibility listing. Canon's DR-5060F - The Scanner with a Photographic Memory. In one simple operation, you get the security and legal acceptability of microfilm storage. Plus, you get the digital convenience of high-speed, PC online access. No single technology or machine has succeeded in handling all aspects of document capture, storage and retrieval. Representing a category of one, Canon's DR-5060F is the first high-speed, high-volume desktop scanner to combine the best of both digital and analog worlds, in one affordable, space-saving unit. In today's digital economy, businesses rely on advanced information technology to carry them into the future. Even the most sophisticated data storage technology can have a limited life span. Technology may change, but the DR-5060F will keep your important documents secure for at least 100 years. If anyone knows the secret to long life, Canon does. A world leader in imaging technology for over 40 years, Canon's superior reputation for reliability is very well documented. The DR-7080C provides high-speed 70 page-per-minute color scanning for batch scanning needs, as well as fast and easy flatbed scanning. 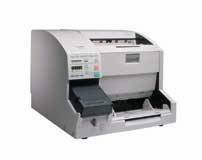 Equipped with Canon's technology, users will also enjoy the benefits of reliable document feeding, easy front-panel operation, and a user-friendly software interface that is common to all Canon DR document scanners. The DR-7080C is one of the most compact scanners of its kind, allowing for easier installation. This extremely durable and energy efficient device, makes it the ideal scanning solution for any size office. The DR-7080C has been tested for compatibility with many of the industry's leading electronic document management solution providers. Please click here for a comprehensive compatibility listing. You shouldn't have to pay a high price for the latest technology in high-speed document scanning. The DR-7580 introduces a new outlook on affordable, production-level scanning. A unique feeding system and advanced sensor technology ensure that a wide range of mixed-paper-size batches or other challenging scan operations are handled with minimal operator intervention at maximum scanning speed-up to 75 pages per minute in simplex or 150 images per minute in duplex. Its ability to recognize and rotate text orientation, correct skewed images, enhance faint text, and adjust gamma settings allow the DR-7580 device to efficiently and accurately capture valuable information included on contracts and forms. Pre-sorting, job-preparation, and the need to rescan become a thing of the past when using the DR-7580 scanner. Whether scanning vouchers or paper sizes up to 11" x 17", the DR-7580 device will self-adjust automatically to each document size or thickness in a mixed batch. With Canon's exclusive, patented on-board Staple Detection feature, the DR-7580 device detects stapled documents and automatically stops the scanning process. Because production-level scanning requires durability, the DR-7580 is a rugged yet compact scanner that's ready to handle almost any large processing job thrown its way. Industry-standard ISIS® and TWAIN drivers, as well as SCSI-III and USB 2.0 dual interfaces, ensure streamlined integration and easy installation. Bundled with CapturePerfect 3.0, a powerful image capture application, the DR-7580 is ready to use out of the box. The DR-7580 has been tested for compatibility with many of the industry's leading electronic document management solution providers. Please click here for a comprehensive compatibility listing. The DR-9080C is the first truly affordable, high-speed, color desktop production scanner that appeals to budgets that could have never justified it before. At 90 pages-per-minute (black-and-white or grayscale) and 50 pages-per-minute (color), the DR-9080C is powerful enough to handle large decentralized scanning jobs. With the DR-9080C, scanned images of photos, charts, diagrams, highlighted text and valuable information are captured with remarkable clarity and detail, achieving optimal throughput at high speed. With a host of advanced features, the DR-9080C performs all functions effortlessly, for continuous scanning at its best. The DR-9080C is the high-end production scanner that you have been waiting for, now at a cost-effective price. The DR-9080C has been tested for compatibility with many of the industry's leading electronic document management solution providers. Please click here for a comprehensive compatibility listing. Canofile for Windows is a document management software for Windows. 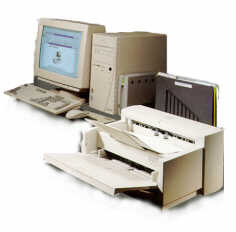 The software constitutes PC-based Canofile along with the DR-30202 document scanner, a PC and an optical disk drive. It is designed to serve single users to approximately 15 users and for approximately 100,000 document folders. The software is also used for sharing the documents, either off-line or on-line, stored on the Canofile 250 and Canofile 510. Industry standard TIFF G4 data format. Also reading from Canofile format data generated by Canofile 250 and 510. Automatic Indexing with Zone OCR. Conveniently share the document over the network with file-sharing. Security definable for individual user. Effectively manages removable media with its Library. Binder function provided for easy distribution of a set document. Gets Paper into your Computer with no sweat!